Chicago’s Ion Vein are veterans enough that when they began with heavy metal in the late 90s digital music technology was in its embryonic experimental stages. The last time they released a full-length album in 2003, this technology was making strong strides already, and today, when the band has been reborn after a long period of silence, Ion Vein decided to take full advantage of it. Having signed with Mortal Music label, the idea is to make several digital releases of several songs from the upcoming new album, with the whole album being ultimately available as a hard copy from the label. Let’s hope the strategy pays off for the band, and circulating free digital music could certainly attract many fans to at least sample the wares. In today’s world when bands sprout around like mushrooms after rain, and listeners often grant a band, new or old, only a few minutes of their time, it is do or die with a few first impression musical minutes the band puts out there. 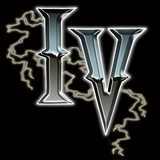 With IV v1.0 Chicagoans waste little time and plunge right in, throwing those riffs like the proverbial hammer on the anvil with Enough. Certainly, it is cool to call yourself progressive, but Ion Vein brand of heavy metal has a lot more to do with other similar American acts like Twelfth Gate or Benedictum than with, say, Symphony X. If “progressive” label is about handling their instruments, then Ion Vein certainly belong, but if it is about making long complicated instrumental forays, then the three cuts on the release have nothing of the kind. This is some muscle-filled, burly music (Love/Hate), and not because Neil Kernon twiddled those production knobs. Guitarist Chris Lotesto does throw a lead in just about every song, but they fit in logically, extending the riffing gallops as in Love/Hate. Don’t let the softer opening of Anger Inside fool you. Ion Vein is to stick with the tough approach through the end, the sinister drilling lead of Anger Inside letting the brood spill out in the open. The new find for Ion Vein is their vocalist Scott Featherstone. The man fits the role of where IV v1.0 music is going, belting those words atop Lotesto’s riffs. His delivery is more focused on the power, ripping the throat, even if the occasional note misses its precision mark. That way he comes off as a passionate human metal vocalist, rather than programmed certified singer. A promising first chapter beginning, Ion Vein’s comeback is off to a good start.